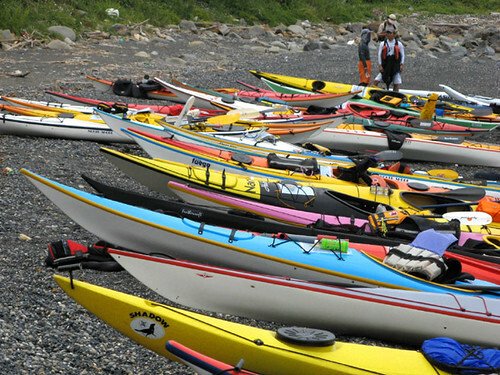 A bevy of kayaks on the beach. Only once a year does this happen in Amakusa. 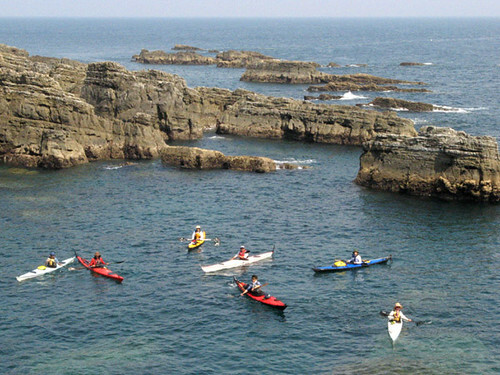 The Sea Kayak Academy took place in Amakusa last weekend. 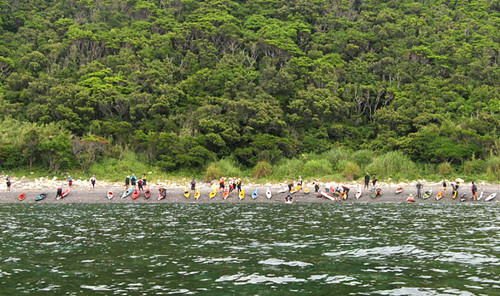 Kayakers from all over Japan came here to participate. It was exciting for us to meet again good friends most of whom we haven’t seen since the symposium last year. Hanging around with them, we felt understood and very comfortable, a feeling that is very rare for foreigners here in Japan. A lot of these people have spent quality time abroad honing their kayak skills in places such as Canada or New Zealand, but that alone cannot explain why they have an ability to relate to people from ‘the outside’. In fact, the ‘outside’ seems to have very little to do with it at all. 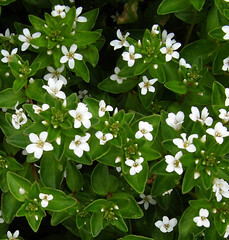 They’re just friendly and outgoing, that’s all; but this combination is really hard to find among people around here. 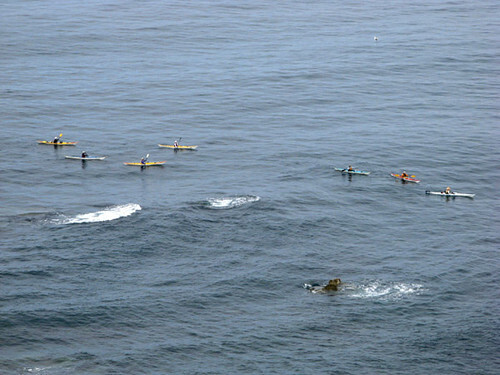 Kayakers must just be a different sort of folk. We like it! With tears in our eyes we said goodbye to them as they dispersed to their own respective corners of Japan. We’ll meet again next year! 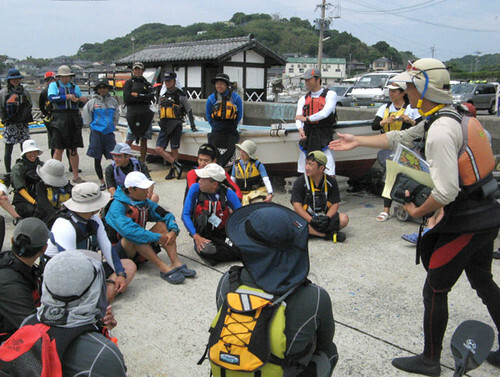 Kayakers receiving info from Amakusa guide Kenji Suemitsu (on right) prior to Friday’s group tour around the Tomioka Peninsula. 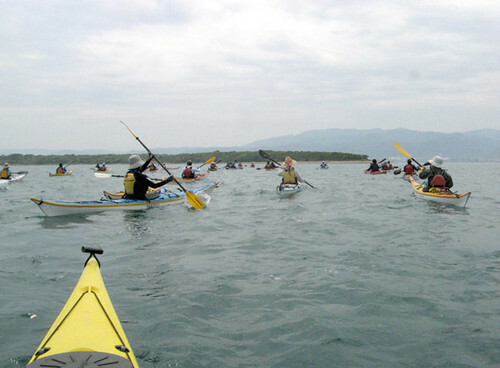 A bevy of kayakers crossing Tomioka Port, aiming for Magari Cape where rare plants and cactuses grow. We stop for a break at a remote beach on the uninhabited side of the peninsula. 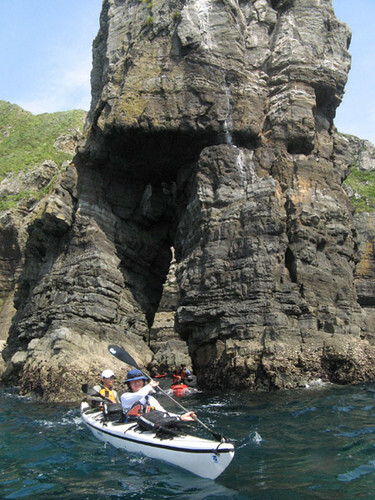 The “Girls Only” tour on Sunday is skillfully guided through the crux reefs at Shikizaki Cape by local kayaker Leanne. 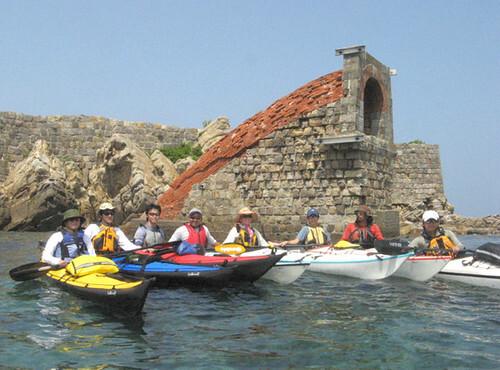 The day after the Academy finished, some of the instructors made a day trip to Katashima, an uninhabited island off the Ushibuka coast. Here we pose at the historic coal mine at Eboshise. 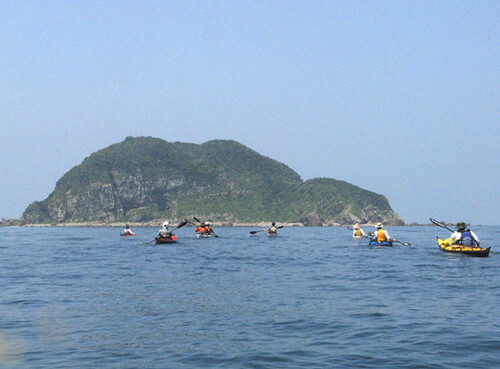 Then we aim for Katashima itself, a 5km hop from the coast. Katashima is an outlying island completely undisturbed by development, and as such it is one of the best places to enjoy Amakusa’s wild nature. 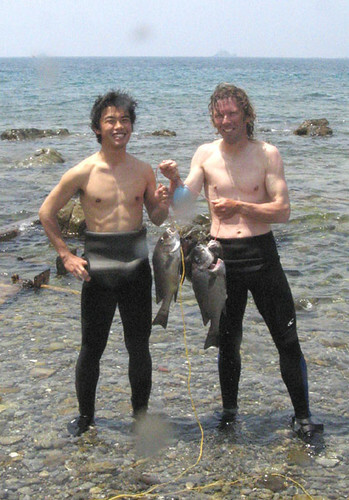 The itinerant guide Akatsuka and Rick show off the results of an hour of spear fishing. Everybody passes through the ‘Mataiwa’ (Crotch Rock) at Katashima. Looks like fun! I wish I could sign up and be there! YO TENIA MUCHO TIEMPO SIN ENTRAR A SU BLOG Y YO SIENTO MUCHO PLACER PORQUE YO SE QUE USTEDES ESTAN BIEN. EL JAPON ES UN PAIS MARAVILLOSO, PERO USTEDES SON MUCHO MEJOR. RECIBAN UN ABRAZO LOS DOS Y QUE USTEDES ESTEN BIEN. ustedes reciban un fuerte abrazo de parte de Maria y mio, estan en un lugar maravillos, gracias por compartirlo con nosotros.Donde se encuentren cuidense y estamos en contacto. felicidades por escribir ahora en japones. This is a great photo essay! I think you'd get a kick out of this video showing what it can be like to go for a paddle on the coast just outside of Vancouver.